This three piece hard rock group had their sound tagged as energized rock. The music defies passivity in the listener. It just isn't the kind of thing that is conducive to soft conversation. . .or loud conversation for that matter. When Rush strike up their amps no words are necessary, for they create a total involvement situation where the music is everything. You want to move, to dance and shout. You want to immerse yourself in the middle of the aura that the high energy - high volume sounds are weaving throughout the room. Rush is made up of Alex Lifeson, lead guitar and background vocals; Geddy Lee, bass and lead vocals; and John Rutsey, drums. Together they'll perform their own compositions or they'll Rush treatment to traditional rock standards, like "Not Fade Away", which is their first single deck for Moon Records. The song maintains enough of the roots that made it the first hit for the Stones, but at the same time Rush give it a few twists bringing it into the seventies. All three of the boys are from a Toronto suburb where they met and formed a band while still in high school some five years ago. Many long hours of practice coupled with their apparent gut feelings of what rock music is all about have honed the three individuals into the powerhouse trio they are today. 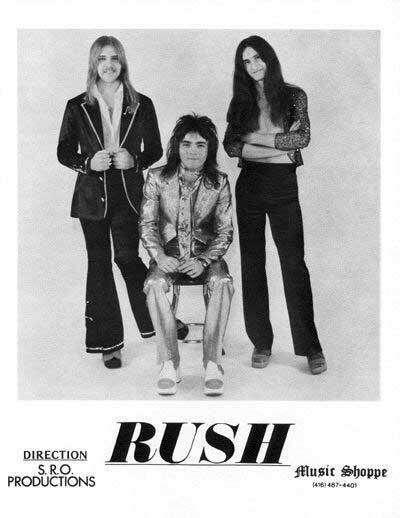 Bedecked in the flash trappings of satin, sequin and rhinestones, Rush look like a rock band and what's more important, they sound like a rock band.